Tributary near the Cascades, Giles County, VA.
Our research explores watershed management practices and hydrological and ecological processes that affect water quality and quantity in headwater watersheds. We focus on runoff generation processes, hydrologic transport and storage, forest ecosystems, and water-soil-biogeochemical interactions. 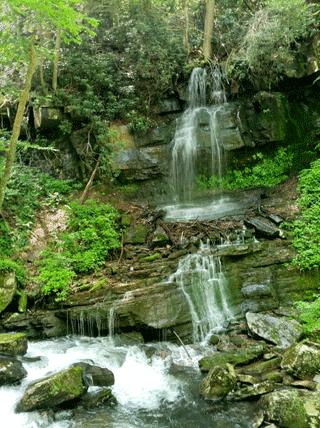 A recent commentary in Nature Sustainability describes why this basic science understanding of how water moves and is cycled within forested headwater watersheds is central to sustainable water management. Our research is heavily field-based, but we often use models to interpret field observations, generate hypotheses, and make predictions. This type of research is of global, national, and local importance since headwaters occupy most of the landscape, are often sensitive to disturbance and adverse impacts, and are the major contributions to downstream rivers where most people live and use water. The overall goal of our research program is to develop better conceptualizations of watershed hydrological processes that can be used to develop predictive models (water quantity and quality), describe hydrologic interactions with biogeochemical systems, and support management decisions.